Early morning view of the Acropolis from a guest room in Hilton Athens. In just a few days in Athens it becomes obvious that the city deserves to be regarded on the same terms as Paris or London–as a major European destination worthy of a lengthy stay. Athens demands attention, of course, for its ancient history, but also for its cuisine, its events (sporting, cultural, educational, international), its natural environs (even local beaches) and its contemporary scene. The great news from Athens, according to people involved in hospitality there, is that tourism is building. Visitors are staying longer, and the tourism season is expanding, too. I understand why. We not only discovered what to do and where to stay in Athens, but why visiting Athens is more fun than ever. Our primary sources are the professional staff at Hilton Athens and the lovely owners of the Athens-based tour company, Greeking.me. Voices from the international corporation and the entrepreneurial operation agree–and are similar in their friendly and personable approach. 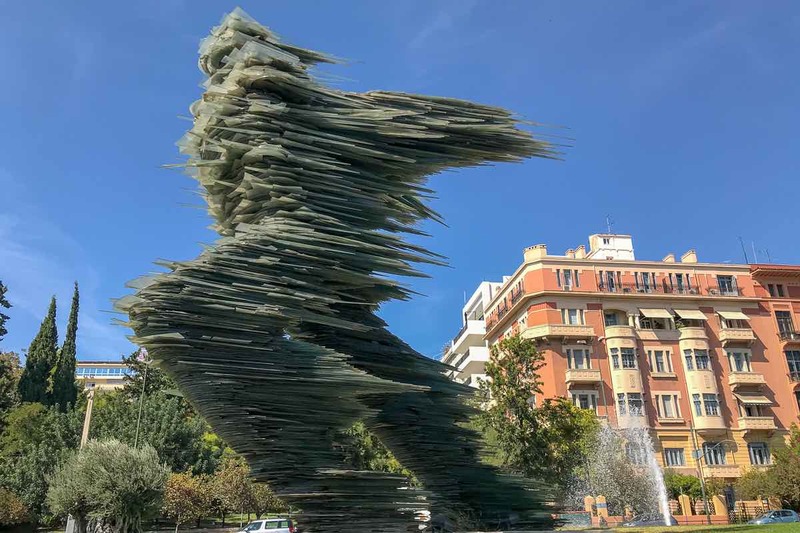 The “Dromeas” (Runner) glass sculpture by Costas Varotsos recognizes ancient history and the annual marathon event that currently winds up near here on Vassilissis Sofias Avenue. At Hilton Athens there is much to impress the casual visitor. For starters, Hilton is part of Athens’ vernacular: locals refer to the area as ‘the Hilton’ neighborhood. 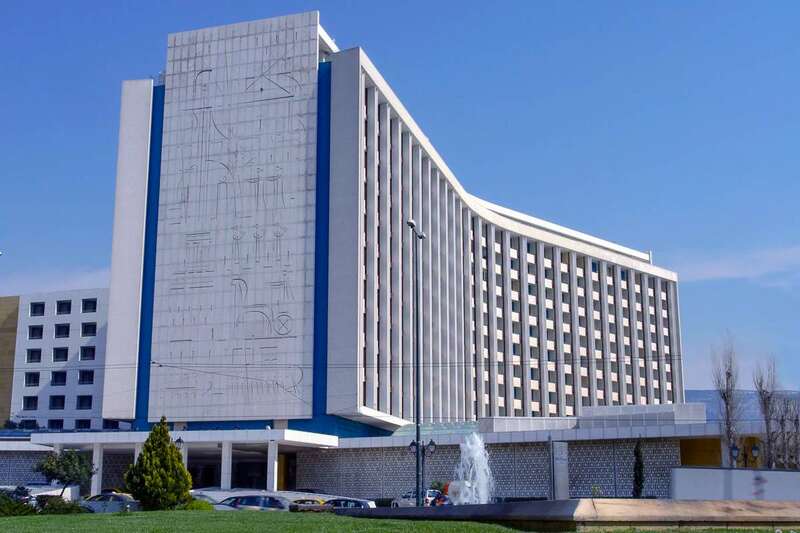 The hotel, built in 1963, was the first international hotel in all of Greece and a groundbreaking example of modern design. The artwork of Yannis Moralis etched into two giant facades ties antiquity to the present day. Major remodeling was completed for the 2004 Olympics. Across the street, the glass sculpture by Costas Varotsos acknowledges Hilton’s place near the finish of contemporary marathon races, here at the birthplace of the marathon. In touting its place in Athens’ history, Hilton Athens refers to the Greek word ‘philoxenia,’ or friend of foreigners. (Its opposite, xenophobia, is what the U.S. suffers from these days.) Staff obviously enjoy being able to serve a full range of guests, from dignitaries to sports fans from all around the globe. While our stay was hosted as part of a small media escapade to Karpathos Island, the rooms with views across town to the Acropolis are accessible to all. 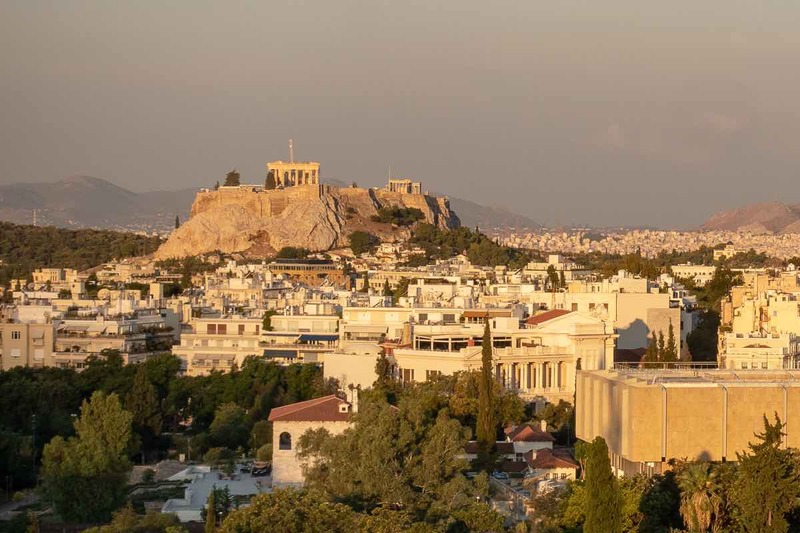 The excellent location is just a twenty-minute walk (or one metro stop) to Syntagma Square, but in a quieter neighborhood of shops, restaurants, museums, and residences. Just up the street from Hilton Athens, through a park, are two excellent museums. So even with just a partial day free on my own, I was able to walk to and enjoy both the Byzantine Museum and Cycladic Art Museum, described below. Galaxy Bar’s signature Mastic Tears cocktail, with view. Photo by Hilton Athens. While Hilton staff are enthusiastic about Athen’s walkability and diverse restaurant scene, they are also proud of the hotel as a social center for local people. The impressive Galaxy Restaurant, with sunset and Acropolis views, is patronized by locals, as is the pool and spa (with membership.) Adding to the vibrant atmosphere, staffers explain, is that the hotel’s clientele shifts seasonally from business clients in winter to families on holiday in the summer. For my part, I’d happily return to this hotel for future Athens visits. The room, the view, the balcony, the comfortable executive level, the fabulous Galaxy Restaurant and Bar, the breakfasts, the hotel’s art gallery and discreet lobby meeting places, and the neighborhood dining options are all impressive. The Porch of the Caryatids in the Erechtheion Temple of the Acropolis. It’s dedicated to Poseidon and Athena. The original maidens are now in the Acropolis Museum. I used to think every visit to Athens required a tour of the Acropolis. I guess you have to do that at least once, for perspective. But with the continued improvements and expansion of the Acropolis Museum and other museums in Athens, it’s certainly feasible to learn about the ancient city without actually dealing with the popular Acropolis site. While the Acropolis is slowly being re-constructed (yes, I’ll return to check on progress), it’s preferable to see ancient art in museum settings. In either case, get yourself a guide, because Athens’ artifacts are endless. They are best visited with a curator to help you select and interpret what you are seeing. I visited the Acropolis on this trip with five others and our guide, Eva, from Greeking.me. We thoroughly enjoyed the story time covering everything from Greek mythology to geopolitical history, and touching on architecture and archeology. I was primed to go visit the Acropolis Museum, but without the time to do so. Acropolis Museum The current museum was completed in 2007, but the original Acropolis Museum started in the 1800s in response to the waves of destruction and looting that have effectively dismantled the site. National Archeological Museum One of the great museums of the world, housing important artifacts of antiquity from across Greece. Byzantine Museum Wow, this museum is a lot bigger than you think when you enter. Do watch the short video timeline of human migratory history near the entrance. The Museum’s permanent collection is a vast, underground display of Byzantine art representing both religious and secular life. The stories of recovery and preservation are almost as astounding as the art itself. Benaki Museum The collections here encompass a variety of art forms representing Greek, Islamic, Coptic, Byzantine, Chinese, and folk art. Rotating and visiting exhibitions range from architecture, painting, photography, and toys. Galaxy Restaurant and Bar We enjoyed a spectacular meal here. Go with the fish. A delicious cold cucumber soup kicked things off, followed by a sushi appetizer. Salads, the fish of the day, and desserts were all accompanied by select wines from Santorini. And the view! Also at the Hilton, for lunchtime beside the pool, Oasis Bar and Grill offers plates to share or devour on your own. 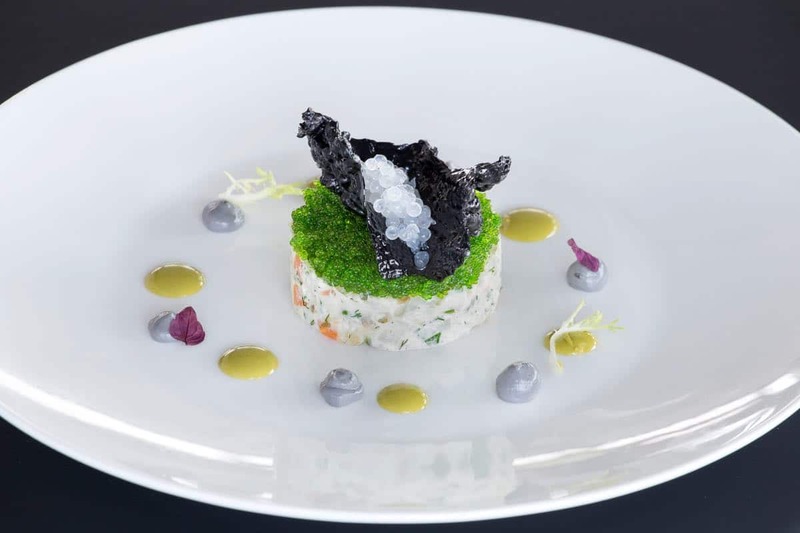 Nolan Fusion cuisine in the thick of central Athens, offering creative twists of Euro-Greek-Asian flavors. Δία ταύτα/Dia Tauta With our Acropolis guide, we walked down the back side, through Monastiraki neighborhood and the Roman ruins area to this traditional cafe on Adrianou Street. Great place to relax after sightseeing, and the moussaka is a good call. Restaurant Cross A casual spot near Hilton Athens, perfect for a light dinner alone for a jet-lagged body. Milos The Athens location of this world-famous restaurant highlighting Mediterranean seafood is situated adjacent to Hilton Athens. Convenient! Hilton Athens For all the reasons noted above, this will be our home next time we visit Athens. By the way, it’s easy to catch a metro train from the airport that delivers you to Evangelismos Metro Stop, across the street from the Hilton. Greeking.me Your guides in Athens and beyond. For some fun reading and travel planning, check out the Greeking.me blog, too. 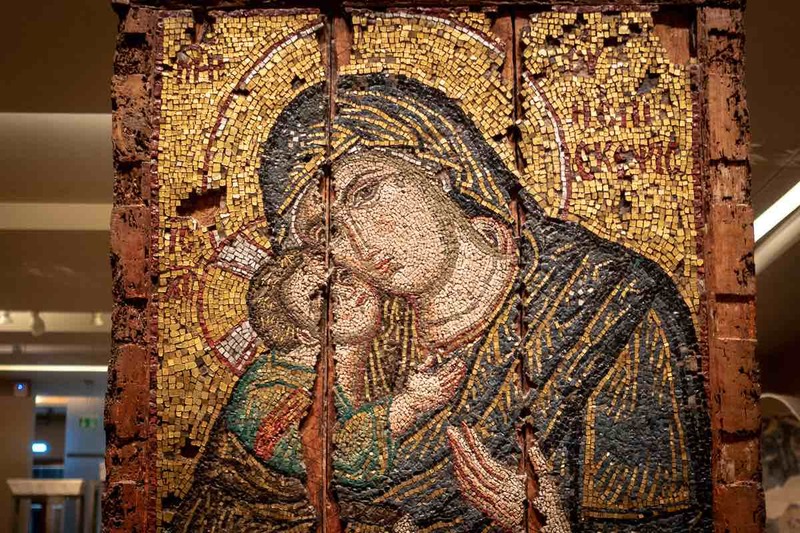 Detail of a mosaic icon of the Virgin of Tenderness, produced by a 13th Century Constantinople workshop and recovered from a church in Asia Minor. The couple started Greeking.me, an exclusive tour company, as a blog in 2015. Here are bits from our conversation. TP50: What made you take the risk to start a new business? Greeking.me: We both wanted to create a sustainable business, to promote the culture and the beauty of Greece, and to get involved with the thing we loved the most: traveling! So, from an idea for a travel blog, Greeking.me actually became a new venture for us, giving us the opportunity to change paths in life and pursue something new and exciting. TP50: You have about 40 different tour offerings. How many of these are in Athens? Greeking.me: We offer 26 tours and activities in Athens. We can also customize any activity according to our guests’ preference. 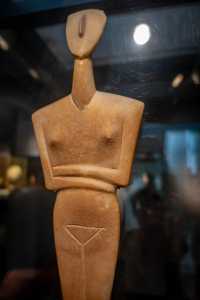 The Bronze Age female figure from the Cyclades Islands has inspired artists through the ages. 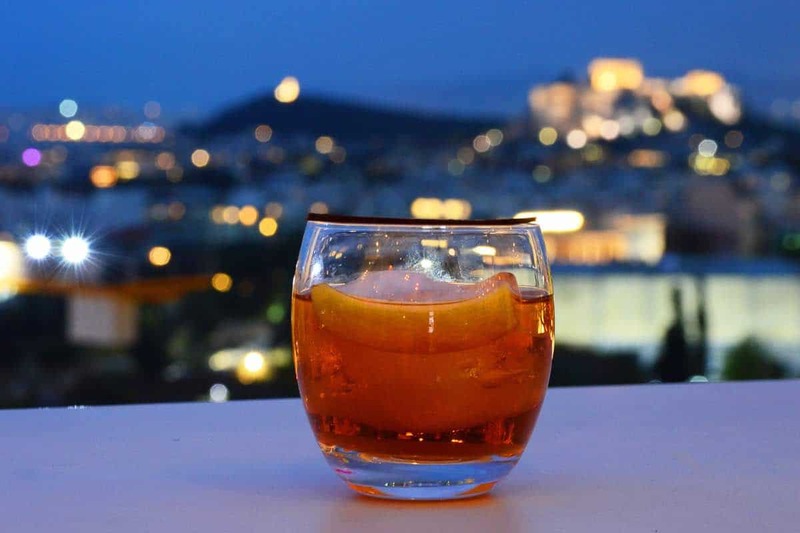 TP50: Beside your Acropolis and food tours, what are other popular tours in and around Athens? Greeking.me: Among others, our full-day trips and special family experiences are loved by travelers. Our team-building events, which include a scavenger hunt in the city, are also guest favorites. TP50: What, in your opinion, are top Athens attractions that most visitors miss? Greeking.me: The beach, definitely! Very few visitors know that by taking the tram from Athens’ center you can reach beautiful, organized beaches in 30-45 minutes! This is [unusual for a capital city] and we believe it’s one of the strongest advantages of Athens. TP50: Besides the Acropolis Museum (and the Cyclades and Byzantium museums covered below) can you suggest interesting museums? Greeking.me: The National Archaeological Museum is definitely one of our most significant museums that contains the richest collection of artifacts from Greek antiquity worldwide. The Benaki Museum is also a very interesting site to add to anyone’s trip as it contains artifacts from the prehistorical to the modern era and an extensive collection of Asian art. TP50: We were told that visitors are staying in Athens longer these days, and that the season is also extending. What’s your experience? Greeking.me: It’s true that efforts have been made by the GNTO (Greece National Tourism Organization) to extend the length of stay in Athens. Although the numbers of 2018 have not been finalized yet, you can have a look at this interesting survey. From our experience, the tourist season has been significantly increased, as it now lasts from mid-March to late November. TP50: What are your offerings outside of Athens? Greeking.me: We currently operate in the Greek mainland, offering tours and activities in the Peloponnese peninsula. One of its highlights is Nafplion town, the first capital of modern Greece, and its surrounding region of Argolis. [This beautiful area] satisfies even the most demanding travelers. The Peloponnese, in general, include the amazing sites of Ancient Mycenae, the Ancient Corinth, the Ancient Olympia and the Theatre of Epidaurus, still operating nowadays. Delphi and Meteora are also two popular destinations, located north of Athens. TP50: I understand you are both originally from islands? What about tours there? Greeking.me: As for our beautiful islands, we are proud to introduce travelers to Santorini, Naxos, Mykonos, Crete (where Anna comes from). And we are currently working hard to include many more locations such as Lesvos, where Nikos comes from. TP50: What are you most excited about in the future of tourism in Greece? Greeking.me: We think that Greece has an incredible potential to become an all-year-round destination. Combining natural beauty with a mild climate, thousands of years of history, a unique culinary tradition and the welcoming character of its people, it can really satisfy the needs of travelers during all seasons. The branding of Greece should be broadened from a “sea & sun destination” to a “must-go” destination! Athens, in particular, has a tremendous opportunity to showcase its surrounding region of Attica. Just a one-hour drive from Athens center, the visitor can find themselves surrounded by numerous attractions, from traditional villages and unspoiled beaches to impressive archaeological sites and places of natural beauty. 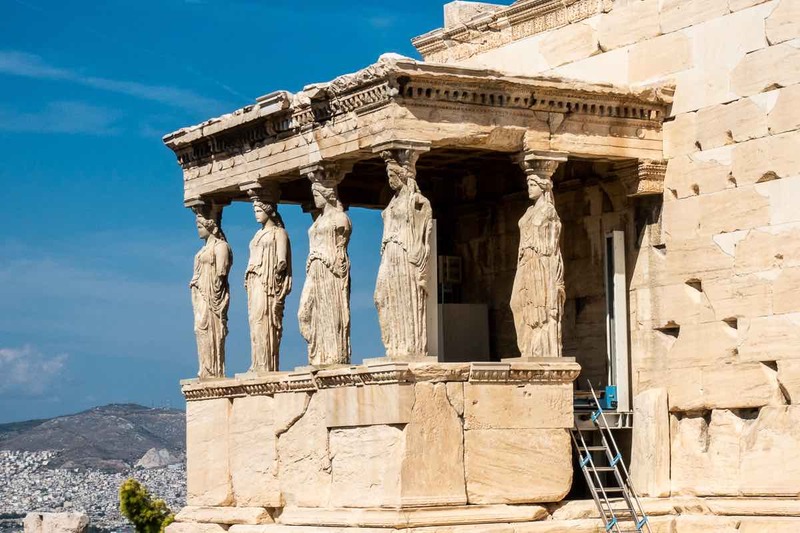 TP50: What should potential visitors know about Greece’s current economy and recovery? Greeking.me: The economic crisis has inevitably affected all [small businesses] in Greece and continues to do so. However, we strongly believe that in every crisis there are opportunities to be exploited, and tourism in Greece has provided us with endless possibilities to innovate by providing new, exciting services to travelers. We are optimistic about the future and our biggest dream is to promote all the hidden gems and unknown destinations in Greece in a sustainable way by respecting their natural environment and local communities. Note: I was hosted in Athens by Hilton Athens and Greeking.me. This story is based on my personal experience and has not been reviewed by our hosts. I thought I was just passing through Athens on my way to Karpathos, but the city offered much more than I expected. What a helpful post. I haven’t been to Greece, but of course it’s on my list. 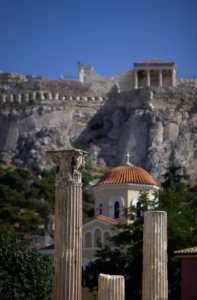 I love the places that Greeking.me suggest in Athens and will definitely look them up for when we get back to Europe. Thanks! I especially enjoyed this visit because it introduced me to so many more places and neighborhoods. I love great museums, and I need to go back for more! So far, we’ve only visited some of the Greek islands and the Peloponesse—and Cyprus (Greece lite). I’m adding this article to one of my Pinterest boards so I can be sure to find it again when Mr. and Mrs. Excitement have the opportunity to visit Athens. Yes! I was surprised at how much I enjoyed Athens itself, apart from being en route to an island. And I was surprised at Greeking.me’s suggestion of the beach! Sounds like another area for me to check out next time, in addition to my list of museums. It’s super easy to get around with the metro. I had to do a second take at this link when I scrolled through the posts as I thought I had mistakenly reposted my Athens post from last week! :-) I am still bummed that we didn’t get a chance to meet while you were here but hopefully one of these days our paths will cross. Looks like you got a great taste of the city both literally and figuratively. I can attest as a regular visitor there in the last decade that the city is back on track and has definitely been discovered by visitors from around the world! Fun post. Thanks, Jackie. With this taste, I’m really looking forward to getting to know the city better, maybe with an extended stay sometime. We’ll be in touch. Athens is so filled with great sights, sounds, and flavours. I love the The “Dromeas” (Runner) glass sculpture. That is amazing!!! That sculpture is nearly 40 feet tall! It was fun to see so much contemporary art in Athens, right beside the ancient sites. What a great time you had in Athens. Thanks for sharing your adventure and the beautiful photos. Glad you had such a wonderful time. We have yet to get to Athens, but it is, of course, high on our list. It was nice to see a post that highlighted the fact that there is so much to see and do right in and around the city – almost everyone seems to focus on the islands and skip over Athens. I generally disagree with you, however, on the idea that a museum is the best place to see ancient art and artifacts. I love museums, but seeing the context of an item is important to really understanding it — meaning the best place to see something is in situ. Unfortunately, we need to rely on museums because we, as a species, seem incapable of giving our art and history the protection (from weather, pollution, crime, vandalism, and war) they deserve in the places where they were created. That makes museums absolutely necessary. (Of course, museums are also necessary to bring the world to those who can’t travel.) Some museums understand this and do what they can to supply some of the original context. None the less, the best place to see the “Elgin marbles” would have been preserved as part of the Parthenon!! I can’t argue that, Cindy. In fact, some of my favorite experiences in Greece are stumbling into Byzantine churches and finding icons in place. The Michelangelo pieta in Florence, for example, just isn’t as powerful in the museum behind glass as it was in the Duomo. But we have to admit we love the preservation of art that museums afford, and the capacity to see objects that would be lost or ruined if left in their remote homes. Thanks so much for the note! You reminded me of this post about the Acropolis Museum from an earlier visit. I haven’t been to Athens. Your post has revealed to me more of Athens than previous ones. And I love your layered look!